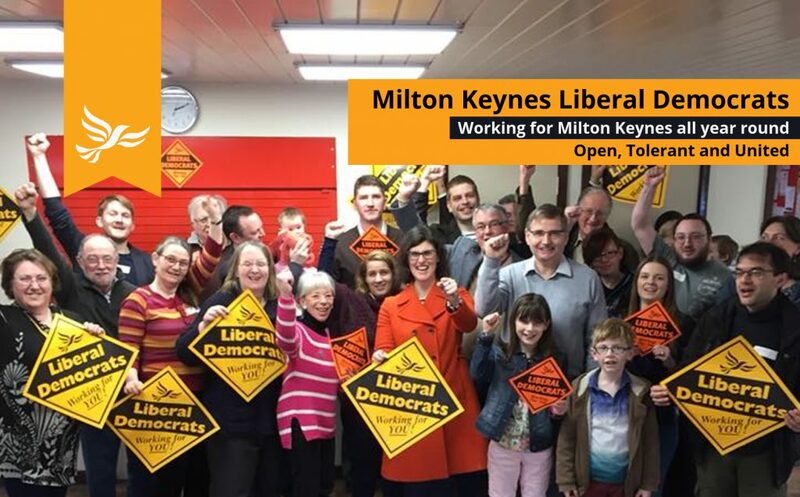 The Milton Keynes Liberal Democrat Manifesto for the local elections, “Demand Better for Milton Keynes”, is launched today. • support for our senior citizens to live independently. The full manifesto is below. It can also be downloaded in full as a PDF by clicking here. The Liberal Democrats are vital for Milton Keynes. From 2002 to 2011 when we ran MK Council we transformed MK for the better. We made the council work for residents by improving vital services for the most vulnerable. We supported buses and their use increased, empowering residents and helping keep traffic off the roads. We helped all in MK take more pride in our area by taking actions such as creating the graffiti buster teams and ensuring derelict cars were removed quickly. We transformed recycling in MK, improving rates from 11% when we took over to 55% in 2011, those rates stagnating since in the years the Tories or Labour have led the council. Recycling rates are now expected to increase again with the launch of the Waste Recovery Park, an innovation planned under the last Lib Dem led council in MK. We are the only party in the last 20 to have majority control in MK, running MK in more of the last 20 years than any other party! With Tories or Labour having minority control of MK since 2011 our councillors have played an essential role on the council, holding the other two parties to account and ensuring the best for residents in MK. Much of MK Council’s progress to help the homeless off the streets of MK in recent years has been from the hard work and ideas of Lib Dem councillors. Our party continues to put the interests of residents and communities first and foremost, defending the most vulnerable in society and ensuring the council works for residents. We are enthusiastic and optimistic for Milton Keynes and continue to believe that MK can be the city of the future. We will fight for enough good homes for all now growing up in MK, for new strategic projects such as a new university and a mass public transport system, while caring for the interests of existing urban and rural residents by ensuring any new developments are well planned with good infrastructure at their heart. We will always demand better for Milton Keynes. Over the last few years the Liberal Democrats have engaged with others to ensure the best for Milton Keynes, including helping change council policy for the benefit for residents. Some of our Lib Dem successes are below. Street Homelessness: The Liberal Democrats have helped change council policy to “housing first”, meaning that those with serious problems-addiction, mental health issues, etc. will be offered housing while they work on the other problems, rather than having to struggle with them while living on the streets. Over 100 people have been given housing this year through that policy, and support to help them with mental health and addiction problems has increased. For those still living on the streets, Lib Dem councillors have actively helped secure the future of the Winter Night Shelter, and enable the MK Bus Shelter and the expansion to the YMCA. Family Homelessness. Most of the homeless in MK are not living on the streets but in temporary accommodation. Hundreds of families are being housed at the taxpayers expense with no secure future home because the market has failed to house them. And many more are in short term accommodation with no guarantee of a year’s stay. We have campaigned for more effective use of temporary accommodation so that today no-one is housed more than a few miles outside MK, B&B has reduced, and no children are outside MK or in B&B. Looking ahead, we’ve helped plans to build more council housing and affordable housing so that we can reduce the numbers in temporary accommodation. Potholes: Liberal Democrat pressure led to change in rules meaning more potholes have been fixed. Until 2018 the council had a strict policy that only potholes at least 50mm deep would be fixed, meaning council officers spent more time measuring potholes than fixing them. The Liberal Democrat changes meant the intervention level was reduced to 40mm resulting in more potholes being fixed, and smaller potholes near ones being fixed are now also being repaired due to the new cluster policy. Environment: Liberal Democrats have fought and succeeded to defend against Conservative Government funding cuts, so that there is still budget to fix street signs and to carry out other essential maintenance. In the recent 2019 MK Council budget we succeeded in securing money to address litter ‘hot-spots’ which need more regular litter picks, as part of looking after our borough. For the future, we have secured even stronger planning policies safeguarding our environment as the city grows. Milton Keynes is a great place to live and to bring up children, so our birth rate is above the national average – and we are living longer than we were, so our population is rising. Our economy is booming, so, even though almost all local people are employed, we still attract workers from outside – and when they get here, they want to live here! So we are growing – and growing fast. By 2050 we estimate that our population will be 450-500,000 people. And that means our children will need a lot more places to live, work, go to school, receive healthcare, etc. And for the cultural life that goes with a big city. We believe that planned growth, planning the infrastructure along with the homes and jobs, is what has made MK successful, so Liberal Democrats are planning for that growth. We want to “make a great city greater”- and that means strong local policies to make sure that the growth keeps MK special. Liberal Democrats have been involved in the current Plan:MK, and are working on plans for MK2050 to secure the infrastructure we will need. The first stage of the 2050 process will come out for public consultation later this year. Life in MK is not great for all right now. For many people, rising housing costs are a nightmare, forcing them into poverty. For others, total lack of housing means a life on the streets or in temporary accommodation. Our low-density city, with poor public transport means they can’t get to jobs, services and leisure activities. And poor access to healthy food, our obsession with the car, and insufficient exercise means too many suffer from obesity, leading to massive impacts on their quality of life from diabetes and heart trouble. The stress involved leads too many to turn to smoking, alcohol or other addictions, which in turn lead to poor health, finances, and ultimately homelessness. In particular, this is affecting our children. 25% currently live in poverty. Obesity among children is rising to dangerous levels. Hundreds of children live in temporary accommodation, unable to maintain friendships, stable schooling and healthcare, and generally to feel part of their communities. And thousands are living in overcrowded accommodation. We MUST demand better. In the pages that follow, we outline priorities to help with the housing crisis, support those on the lowest incomes, help both children and adults with mental health problems and reduce obesity. Together those policies can have a serious impact on our children’s future. They would be much easier to implement if our Government would take children’s future seriously. Liberal Democrats continue to work at all levels to demand better for our children. Having good and affordable homes for all residents is essential to making sure people have stability in life. Milton Keynes is a great place to bring up children, so every generation is larger than the previous one. MK has successfully attracted more businesses and employers, and more jobs have attracted more people to Milton Keynes. While our population has been increasing, not enough homes have been built so that many families in Milton Keynes are living in overcrowded accommodation or ‘sofa surfing’ between friends and family; there is a hidden homeless crisis in addition to the visible homelessness we have seen on our streets over the last few years. The housing crisis in MK worsens other problems including being a source of much of the poverty in our area. Rough sleeping reached record levels. Many children are being brought up in poverty because of the cost of housing, and where families are forced to move regularly it can seriously damage children’s education, ability to make friends and build personal confidence. We are demanding that MK has more housing, the right housing for its needs, at prices residents can afford, and to a decent standard fit for the future. We will strengthen Council policies to ensure that we deliver at least 36% affordable housing on Council and MKDP land as well as the 31% on commercial developments now required in Plan:MK. We support a new council housing building programme to build family homes at truly affordable prices. The council needs to be clear about types and sizes of homes we need; in particular, developers are not building enough 3 bed homes that many families need. The council needs to give clear advice and use all tools to influence what is built. There needs to be more safe housing for young people who have left home and aren’t able to rent privately. We will support the Council in discussions with the landlords that specialise in young people’s housing to bring new schemes to the city. We are pressing for any spare places from university accommodation to be available to MK’s young adults too. There are many older residents who feel stuck in homes too large for them to manage and don’t have the savings to downsize without help. MK council should investigate options to support voluntary downsizing. and finally – we need better information to plan the homes we need. We are pressing for the Council to bring in a housing need register by March 2020. When the new lettings system comes in, it’s vital that it gives all residents a fair chance of getting housing based on housing need. Homelessness devastates lives. Thanks to improvements Lib Dems pushed for over 100 rough sleepers are now in permanent accommodation, but there is more to be done to help rough sleepers and to prevent homelessness. For those who are homeless, proper temporary housing should be available in Milton Keynes: it is not good enough to house people miles away or in B&Bs. Milton Keynes must be a place where people have a safe, secure place to live. Continue to work with partners to improve services to prevent homelessness, including more support for those with mental health problems and better advice for those at risk of homelessness. Continue the Housing First policy to support people to get off the streets while they work on improving their mental and physical health, beat addictions, and improve their work skills. Continue to press for a sufficient supply of temporary accommodation to ensure that no-one is housed outside MK or in B&Bs. Campaign to end the use of “Section 21” that allows landlords to evict tenants with no reason – the main route to homelessness in MK. we support the Council working to bring all Council homes up to the Governments decent homes standard within 5 years. We demand that MK Council produces a plan to bring all Council homes up to the ‘A energy efficiency rating’ required for new homes, to help reduce energy costs for residents and reduce MK’s carbon footprint. The council needs to support private renters too; we support the Council work with private landlords to provide more good and affordable housing. We support the Council in working to advise home owners on the help including grants available to bring their property up to standard. Our party supports the plan to regenerate some of our older estates where the process involves and is supported by those local communities. We have led scrutiny of the regeneration process and welcome the administration’s commitments to implement more transparent and consultative processes in the future. We support moves to widen the scope of the regeneration plans, recognising that needs such as improved access to health care information, or healthy food, local employment and training, etc. can be just as important as housing. We also support the recognition that demolition is not the only option for improving housing, but continue to support demolition where the local benefit warrants it and local residents opt for it. We believe that the managed environment should be safe for our residents, landscaping and road repairs should be carried out properly, and our streets should be cleaned and abandoned cars removed quickly. Milton Keynes is suffering from increasing neglect, and there must be a change to fix the issues which have been worsening while the Conservatives and then Labour have been running the council. We demand better for the removal of weeds and plants in and near paths and roads, since these can both make paths and roads less safe, and can cause avoidable long term damage to our infrastructure. Litter and dog mess are hazardous to children, pets and wildlife. The council needs to ensure weeds are removed properly. Paths must be kept clear and safe to use, including removal brambles by redways which can be a danger especially to children and cyclists. The Council should negotiate with the Parks Trust to secure the long term management of our landscaping. The new money allocated by Liberal Democrats should be used to clear up the litter and dog mess grot spots, while we work with communities to reduce the amount of litter and dog mess. In 2018 the Liberal Democrats had success changing the pothole policy about depth and size to ensure the council repaired more potholes. We will continue to campaign for safer roads and paths for residents to use, including ensuring council staff spend more time fixing potholes and less time measuring. Paths and redways must receive better treatment as poor surfaces in these areas have a larger impact on more vulnerable residents with limited mobility. Safe streets need reliable lighting – and many of our street lights now need replacing. We will continue to press to speed up the work, and to provide lights that are both energy efficient and effective. To ensure good water flow and prevent flooding we will push for the council to work with all appropriate organisations to ensure all necessary dredging (clearing of blockages) takes place in rivers across MK. We will push for better maintenance of drains to reduce the chance of flooding of roads, redways and properties. Liberal Democrats are passionate supporters of campaigns to reduce waste, including the elimination of single use plastics. Our party will continue to lead efforts in MK Council to reduce waste, and for good support and communication to go to the public and local organisations to reduce the environmental impact in Milton Keynes. We will continue to fight to maintain Milton Keynes at the innovative edge of recycling and aim to continually increase MK’s recycling rates. Much of the improvement in recycling rates delivered when the Liberal Democrats last ran MK Council was by making it easier for residents to recycle correctly, and we will campaign for a good system that residents can use. We support the Waste Recovery Park in Wolverton, initiated by the Liberal Democrats, as an innovative and efficient way to increase recycling and reduce our impact on the environment. We will get a grip on Labour’s failed policy for the delivery of replacement recycling sacks. We will campaign for a new delivery process allowing residents to pick an agreed location at their properties with the sacks being delivered to that location within 5 working days. We will campaign for a return to collection points on a click and collect basis at suitable locations across Milton Keynes, ensuring residents can collect sacks without a return of the abuse of the free sacks made by some companies which used them as packaging. If the current provider cannot provide the required changes we will demand a review about who does supply the service for MK Council. The Lib Dems will encourage recycling and reduce the amount of plastic we are using on replacement sacks. We continue to defend public transport as it is essential for those without access to a car, the elderly, young, and the low paid. Early morning, evening and weekend services are essential for the low paid to work 7 days a week. But beyond that, a move to more use of public transport, and cleaner public transport, is essential if we are to reduce congestion and pollution and carbon use as we grow. We will continue to fight for bus services to be maintained and improved, for all residents to have access to a service nearby. The council must continue to support bus services which are vital for local residents, where necessary using subsidy to ensure vulnerable residents have access to transport links. We will continue to push for more evening and Sunday buses. We will support development of a mass transit “bullet bus” scheme to reduce congestion as we grow and make public transport more attractive. We continue to support the variety of “shared transport” schemes that reduce congestion and pollution from single car use. We continue to push for electric vehicles to be used in all public transport schemes to reduce pollution and carbon use. Liberal Democrats support independent living for our senior citizens, being mindful of the importance of quality support for independent living. There should be a review to introduce a Warden Service to support residents who wish to remain in their own homes as well as maintaining the superb care provided at Milton Keynes Sheltered Housing Schemes. We will continue to push for MK Council deliver better services for the growing number of elderly residents in MK including those suffering from dementia, working collaboratively with the NHS to deliver services and holding the NHS to account when necessary. To press to ensure help for families in poverty in Milton Keynes. To press for increased long-term funding of children’s social care. Improve the Council’s recruitment/retention of high-quality social workers. Build on the work of the Council’s Multi Agency Safeguarding Hub (MASH) particularly its relations with schools. Work with the NHS to ensure adequate funding for local youth counselling and mental health provision directed especially at reducing waiting times and, where necessary, providing beds. Support policies to increase the number of foster parents within MK. Speed up the Council’s adoption procedures in order to reduce the number of children waiting for a family. Ensure all steps are taken to make the transition from children’s to adult social care as smooth and seamless as possible. Where there are new developments in Milton Keynes good healthcare provision must be provided to the new residents in a timely way. Ensure that any Brexit effects as to Care staff are mitigated as quickly as possible. Traditionally most local council funding has been from central government grants, council tax providing a smaller share of funding. In the last 8 years central government has cut MK Council’s budget by £145m, resulting in a fall in money for services for residents despite an increase in council tax. While we call for a change in policy from central government, we will fight for a council budget which is sustainable in the long-term in the face of further cuts expected in the future. This will mean we can avoid a situation like the Tory run Northamptonshire County Council running out of money! While funding is being cut, the council also needs to look for ways to better spend the resources it has, this includes working alongside other councils for joint services and investing in technology to ensure staff can provide the best services possible in the most efficient ways. Despite the talk of the end of austerity, Milton Keynes faces ongoing challenges as the Rate Support Grant comes near to an end. We need to maintain the stable situation that two balanced budgets for Milton Keynes Council have created while avoiding any effects on front line services. No cuts to libraries, Children Services and maintaining Adult Social Care at a high level. Continue MK Council exploring shared services with other local councils to enable ongoing savings in things like HR and Payroll also including procurement. Ensuring the Council has the best IT system in place to help deliver a good and cost-effective service to residents. Maintaining council reserves at a level that will in the short term avoid the Council becoming insolvent through lack of finance. Joining with the Local Government Association for a sustainable financial agreement with Central government which can protect services for residents, since the current Conservative government’s plans are expected to cause more councils to run out of money like Northamptonshire (section 114 notices). We will accelerate the Council’s digital transformation programme to make services available online for those who wish to use them, ensuring that all Council applications are tablet and mobile compatible. The Lib Dems will take inspiration from the best online services we see from other Councils, and be forward-thinking in seeking efficiencies and improved services. Residents need a good system to report issues, which should be as efficient, reliable and transparent as possible to give greater confidence. Demand better reporting for roads issues. We will ensure that residents can report online missing and broken street signs, and roads needing line repainting. The Labour administration have removed these options due to budget cuts – we will campaign to reverse this and call for a review in the next budget to understand the scale of work needed. The Lib Dems are determined to restore pride in our estates and streets. Demand better on recycling sacks a better system to order recycling sacks; see the section in “Protecting the Environment in the World”. We demand the council be compassionate and humane to those who have lost a child. The Government has failed to deliver on their pledge to set up the Child Funeral Fund despite this being promised by the Prime Minister in April 2018. In the interim we will campaign to allocate money for the council to match this pledge, and to not charge for child burials or cremations for those under the age of 16. We will put pressure on the Government to make good their pledge. The Lib Dems will always support those at their time of greatest need. Our highest priority is to protect the vulnerable from the impact of cuts being imposed by the Tory government in Westminster. We will continue to work with other organisations to support our communities as efficiently as possible. We will continue to support voluntary sector organisations and charities who work with low-income families to find real, long-term solutions to the plight of our most vulnerable individuals and families. And we will review the use of the short term help funds the Council offers to those in dire need. As Milton Keynes Council shrinks with imposed cuts, we would work with the Voluntary Sector and Parish/Town councils who may be able to take over some services which may otherwise be cut. We look forward to a world in which all people share the same basic rights, in which they live together in peace and in which their different cultures will be able to develop freely. We believe that each generation is responsible for the fate of our planet and, by safeguarding the balance of nature and the environment, for the long-term continuity of life in all its forms.